@ Adrian, Like you, it's the textures and flourishes that draw me to the building. You're right, the image is a little tilted. Working around a fountain and benches, I wasn't in the ideal position. I made several cropping and transform adjustments in pp but reached a point where an improvement in one area worsened another. Very dramatic image with the lighting and background. 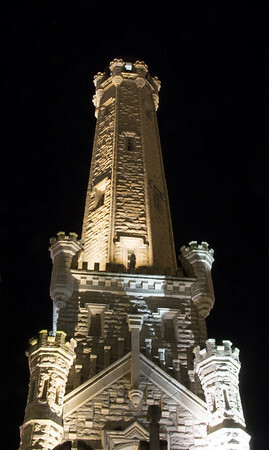 Ever since Ricky posted his photos of the Alamo, I wanted to shoot the historic Water Tower. I had intended to capture more of the structure, but couldn't find a location without trees, buildings, or poles so focused on the tower portion. Note on exposure: This was taken at f/25 which my camera indicated would be underexposed at 30 seconds, the longest built-in shutter speed. By opening the aperture 3 clicks (1 stop), the camera indicated 30 seconds would be sufficient. I changed to manual exposure, shutter = remote timer, and aperture back to f/25. To change the time by 1 stop, I doubled it from 30 to 60 seconds.